No one likes the chores that come along with winter. Shoveling snow and scraping ice off your car in the morning is probably not the way you want to start your day. Fortunately, there’s a way to improve the value of your home and avoid these hated winter chore. The reason you have to scrape ice off your car is that water in the air condenses and freezes on the car overnight. If the car is protected from the outside air, however, this isn’t an issue. That’s why a carport is a great addition to your home. A carport can keep your car safe from the harsh elements. In summer, that means harmful summer rays that can fade your paint and thunderstorms can’t reach your car. And of course, in winter, the cover of the carport will keep snow and ice from piling up on your car. By putting your car in a protected space, the likelihood of rust is reduced dramatically. 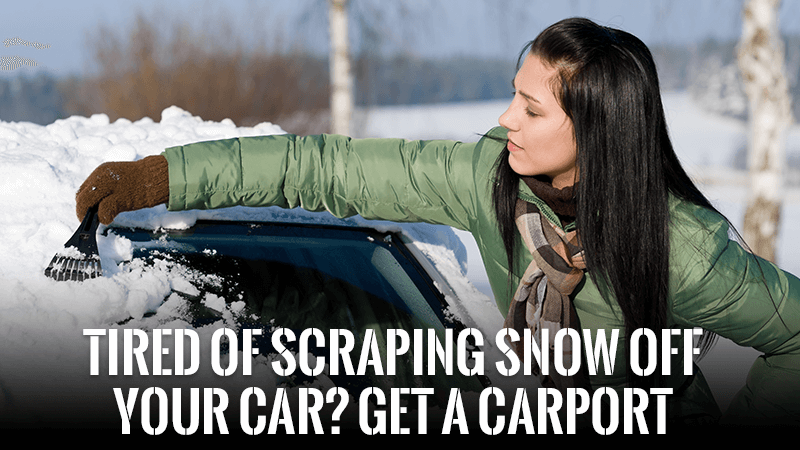 That can not only save you thousands of dollars in potential repair bills, but also increase the resale value of your car should you ever decided to trade it in. By having a covered and protected area of your home that can be used for storage, you will be able to preserve and protect tools and equipment. Large items, such as lawn mowers and ATVs, can be stored underneath the carport safely throughout the winter in a much more secure area than your backyard. It’s also possible to add a built-in workbench or specialized storage area for tools. This area can be in a separate, enclosed space apart from the rest of the carport, or as an open area inside the carport itself. Many people choose to include a covered and fully-enclosed shed into their carport design, while some of the most complicated designs include small rooms with power and water. Adding a carport to your property is an easy way to add value to your home. If your home doesn’t have a garage, the car port can offer you a covered, protected area to keep your car, bikes and other vehicles. If you ever sell your home, this will boost the appeal of your home, as homeowners are always looking for a safe place to park and store their things. This protected area is also a great way to preserve the value of your car. Parking your car outdoors every night now only leaves it open to potential crime and vandalism. You may also qualify for a discount on your auto insurance by leaving your car in a secure area at night. If you’re interested in adding a carport to your home, contact Mike Sikora’s Dayton Home Improvement.